What Is DA Form 5960? DA Form 5960, Authorization to Start, Stop, or Change Basic Allowance for Quarters (BAQ), and/or Variable Housing Allowance (VHA) is a United States Army form used to authorize military officials to begin or discontinue paying Basic Allowance for Quarters or Variable Housing Allowance During the financial portion of in-processing, each Soldier must re-certify entitlement to Basic Allowance for Housing (BAH) regardless of dependency status. This re-certification is done via the DA 5960 Form. The Soldier may provide proof of support or residence for their dependents to also be eligible for BAH. The latest version of DA Form 5960 - often mistakenly referred to as the DD Form 5960 - was revised by the Department of the Army (DA) on September 1990. 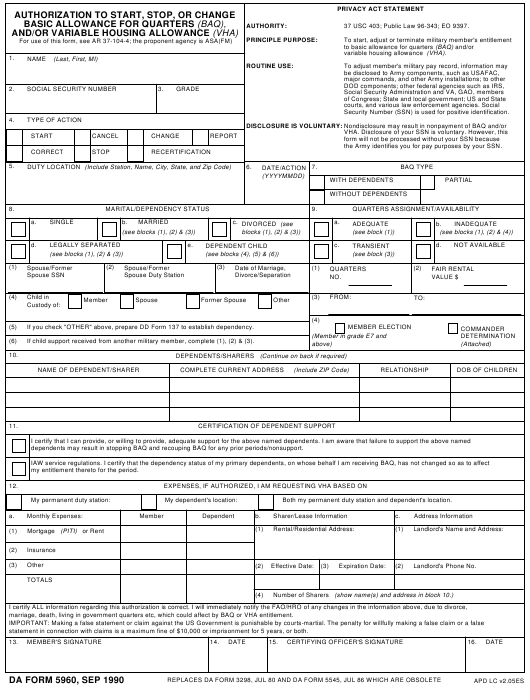 A fillable DA-issued DA Form 5960 is available for download below or can be found on the Army Publishing Directorate website. 37 USC 403; Public Law 96-343; EO 9397. Security Number (SSN) is used for positive identification. the Army identifies you for pay purposes by your SSN. If you check "OTHER" above, prepare DD Form 137 to establish dependency. If child support received from another military member, complete (1), (2) & (3). dependents may result in stopping BAQ and recouping BAQ for any prior periods/nonsupport. my entitlement thereto for the period. Both my permanent duty station and dependent's location. marriage, death, living in government quarters etc, which could affect by BAQ or VHA entitlement. statement in connection with claims is a maximum fine of $10,000 or imprisonment for 5 years, or both. Supply your identifying information in Boxes 1 through 3. This includes your name, rank, and SSN. Indicate the type of action you are using the form for in Box 4. Enter your duty location, date and type of quarters in Box 5. Identify your marital and dependency status in Boxes 7 and 8. Identify the type of quarters you will be moving into in Box 9. Provide the information on any dependents that will be sharing your quarters in Box 10. For Box 12, enter the information about your monthly expenses and similar accounting information of any dependents not currently living with you. Include your mortgage payments, insurance, and any other regular obligations. Sign and date the form and hand it over to the commanding officer for signing. Keep a copy of the DA 5960 form for future reference and send the original to the proper authority. Every soldier needs to recertify their entitlement to Basic Allowance for Housing annually. The re-certification paperwork includes the DA Form 5960, DD Form 93 (Record of Emergency Data) and SGLV (Servicemembers' Group Life Insurance). All paperwork needs to be current and present in the iPERMS Record Review Tool during the Annual Personnel and Financial Record Reviews.